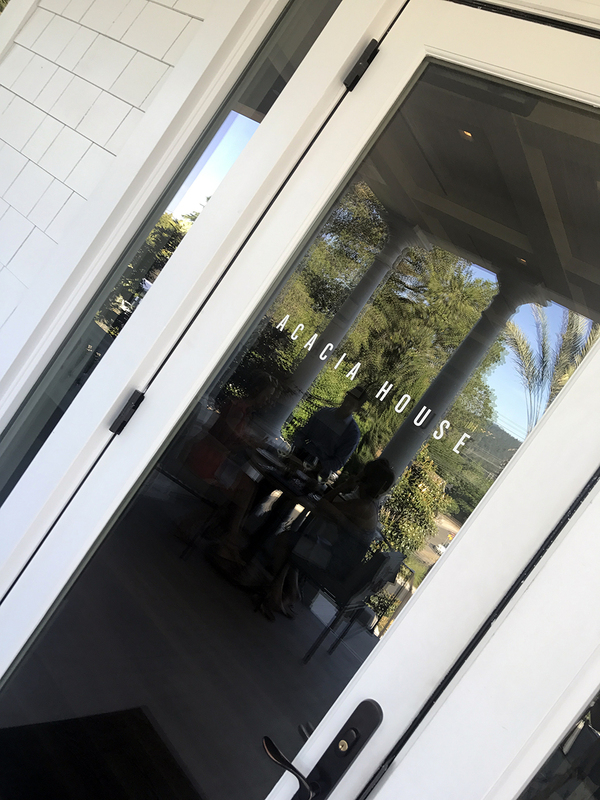 Las Alcobas, the controversial resort just north of Saint Helena has revived a piece of Napa Valley history by renovating the old Victorian Acacia House into a comfortable, friendly, fine dining restaurant ran by Top Chef Masters winner and The Next Iron Chef competitor Chris Cosentino. I have only lived in Saint Helena for four years, and as long as I have lived here, I have wondered about the old house on the hill just north of town. It always seemed so sad and lonely, and I wondered exactly when this old soul would be renovated. In 2014, Starwood Hotels & Resorts broke ground on what was once The Grandview Hotel & Spa. This Victorian has quite a history, built in 1907 as a private residence and transformed in 1911 into the St. Gothard Inn for quite an extensive time period. It then became the Grandview and later Grandview apartments. Starwood tore down all of the structures except for the Acacia House, building Las Alcobas, the luxury resort that surrounds this gem. I was excited to enter the Acacia House, the house I watched for months on end receiving a makeover. The grounds are beautiful, and the hotel is amazing, and as you can imagine, luxury like this doesn’t come cheap. The rooms can cost up to 3000 dollars a night. Entering the bar and lounge, the Victorian has such a clean and refreshing vibe, no creepy ghost-like feelings when you walk into this once large home. 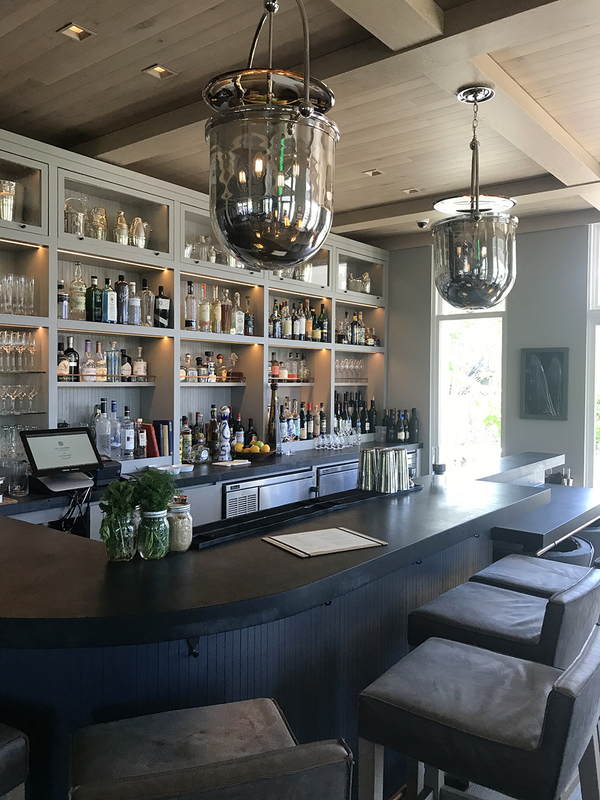 The bar and lounge are beautifully appointed with natural wood ceilings, stunning fixtures, and cool colors. All the furniture was hand-made in Italy and brought over to the hotel. The head design firm, Yabu Pushelburg has quite the resume, with projects from New York City to Shanghai. We showed up to the quaint bar area with a pleasant size lounge to start with a cocktail. It was one of those hot summer days, so we knew we wanted something refreshing. There were many specialty cocktails on the list as well as wine and beer. All cocktails ran 12 dollars, and the bartender recommended the Margarita Las Alcobas. It turns out it was the best margarita I have ever had. The margarita is served up, and instead of salting the rim, they add a salted foam to the top of the cocktail so that in every sip, you get a nice balance of saltiness. The margarita was light, and not too sweet, served in a lovely etched glass reflective of the Victorian era. 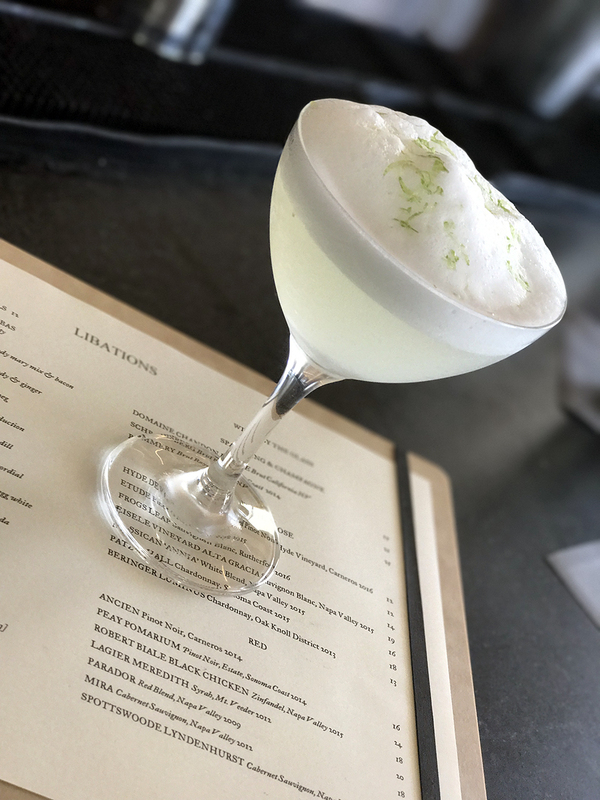 The foam, soft and light, topped with lime zest was almost like a meringue. Do not leave this place without trying one! Other specialty drinks were St Helena Chill, their take on sangria and The Acacia Cocktail, Bulldog Gin, honey, crème de violet and sparkling water. While enjoying a drink at the bar, the full restaurant menu is also available. After enjoying a margarita, we moved into the dining room where we were seated by the window. 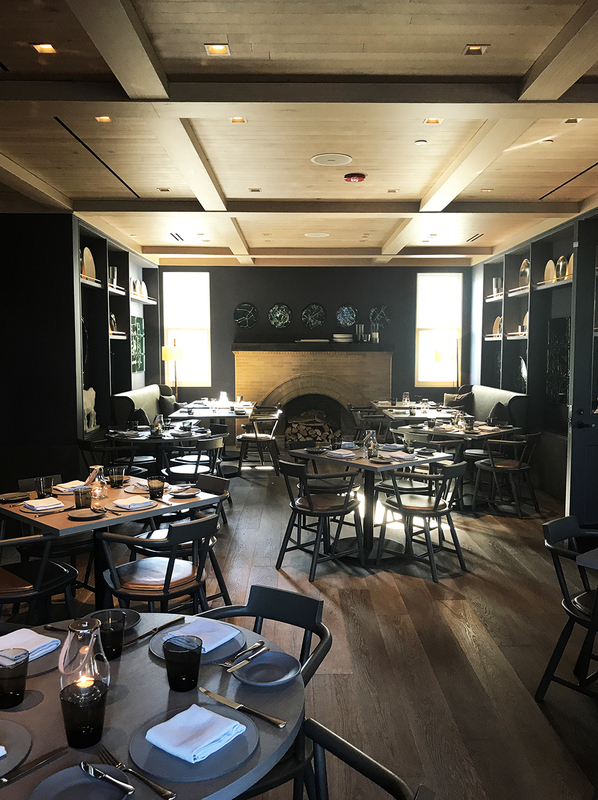 The dining space is cozy with a capacity of about 50 people. Once again, beautifully decorated with a nice upscale casual feel while still keeping some nostalgia like the old brick fireplace. We were the first to be seated, and it was a very comfortable space. Our server was very gracious and gave us the 411 on some of the fan favorites. Among them, a Hamachi Crudo appetizer, Sweet Pea Rigatoni and of course the Kobe beef rib-eye cap. Another interesting item on the menu was Iberico de Bellota, in which I had to ask, what is Iberico. She explained it’s a type of pig from Spain and Portugal whose diet mainly consists of acorns and is oilier and saltier than other types of pork. While waiting for the appetizers to come out of the kitchen, we shared some of their house-made olive bread and sprouted wheat loaf accompanied with Strauss Family butter. 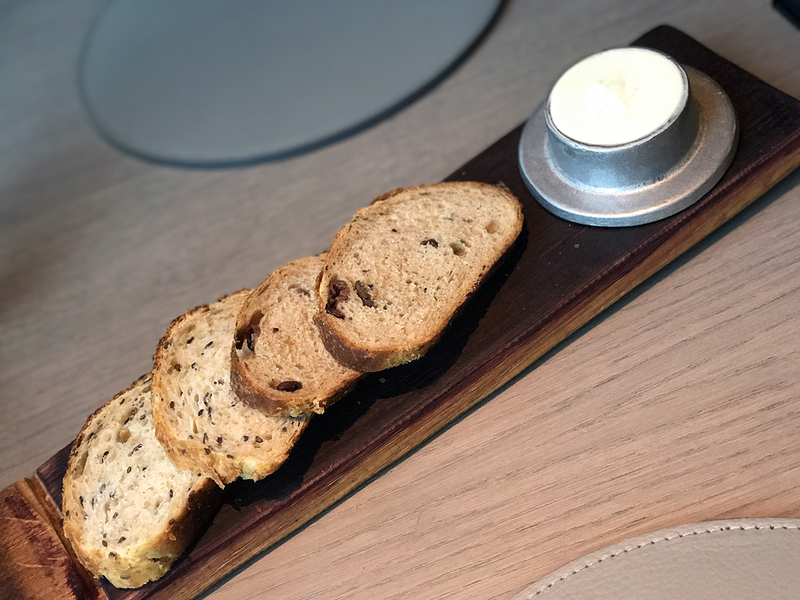 The olive bread had just the right amount of olives and the creamy homemade butter topped with salt was delectable. Our appetizers arrived, and they were visually stunning. 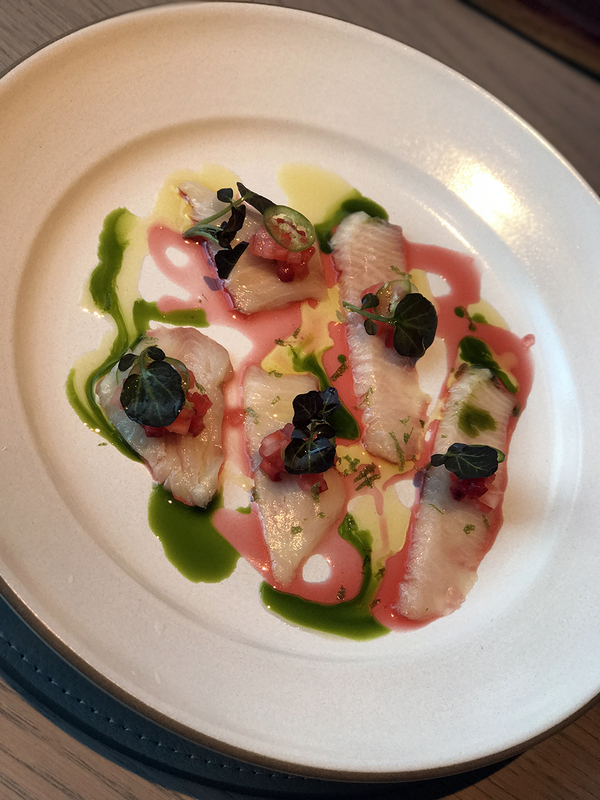 The Hamachi Crudo was topped with fresh macerated strawberries, thinly sliced serrano chili and house made rosé drizzle. The colors were vibrant, and the fish was fresh and light, literally melting in your mouth. The strawberries balanced out the slight heat of the serrano chili, the whole dish tasted like spring. The Eisele Sauvignon Blanc paired wonderfully with my appetizer. Crisp with hints of grapefruit, grass and lovely summer peaches. It was well-balanced with a kiss of oak and a light minerality on the finish. My husband’s seafood ceviche, the special of the night, had calamari, crab, and shrimp, atop an avocado puree with a radish salad and a lime foam (foam was a very prevalent theme throughout dinner.) It was fresh and didn’t have that soup-like texture of some ceviches. The seafood was the hero, but it was still a nice balance with the light radish salad and the more robust avocado puree. The lime foam was again an excellent complement to the dish, light and airy, adding the right amount of citrus. While we waited for our main courses, Zoe, one of the in-house sommeliers came over to brief us on the wines by the bottle. At the time I visited Acacia House, the wine list consisted of 30 bottles, all local wines, sort of an interim wine list. The final list will be composed of over 200 wines, all local and all with a story. I told Zoe what we had ordered, and she suggested the Robert Biale ‘Black Chicken’ Zinfandel. It is one of my personal favorites, but my husband is just not too keen on Zinfandel lately. 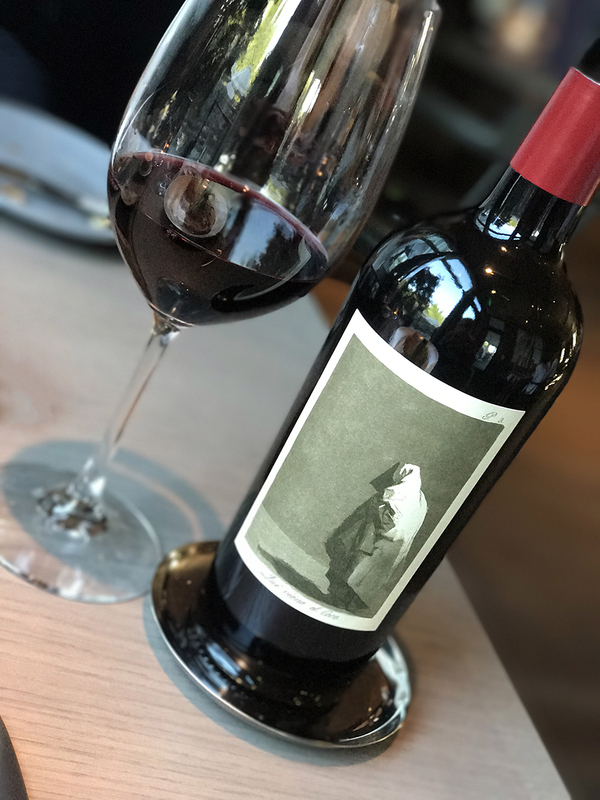 Going off the menu, and she suggested the 2014 el Coco Napa Valley Red Wine, a blend of mainly Cabernet Sauvignon with Zinfandel, Petit Verdot, and Merlot. El Coco is a small project created by Saint Helena native and former owner of The Prisoner. He incorporates old vine Cabernet vines from the Dr. G.B. Crane Vineyard, a highly sought after grape and uses them to create an easy drinking, fruit forward blend. She recommended it because it would go with my pork as well as his ribeye. She was right about the wine, it was excellent in every way, soft on the tongue, yet bursting with flavor, we both had our different flavor profiles with two separate entrees, pork schnitzel vs. Kobe beef rib-eye cap. My schnitzel, pounded very thin, had a nice crispy crust, yet still tender inside. 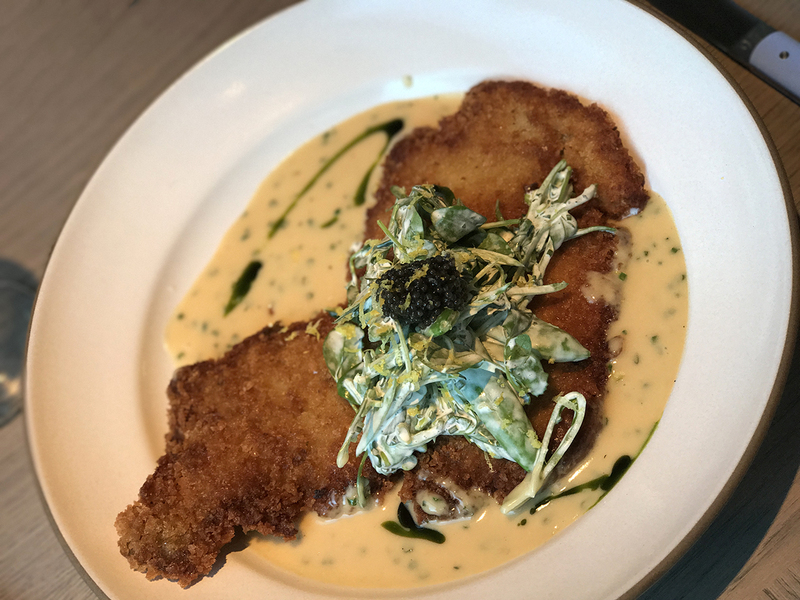 The beurre blanc surrounded the pork, and the crunchy snap pea salad topped with caviar ranch was a nice contrast to the heaviness of the dish. The wine paired nicely, not overpowering the schnitzel, letting the meal come full circle. The Kobe beef, cooked a lovely medium rare, came with crispy onion rings. The jus with peppercorns gave it some heat and the side of Aligot potatoes (potatoes blended with cheese) presented in a blue Le Creuset side dish was decadent. I was fairly full by the time dessert came around. With two rounds of bread, a starter, and a main too big to finish, I chose a light dessert, the creamsicle. My husband decided on the most decadent, the chocolate, a play on a triple layer candy bar, chocolate cake, chocolate mousse, covered in chocolate and drizzled with caramel. 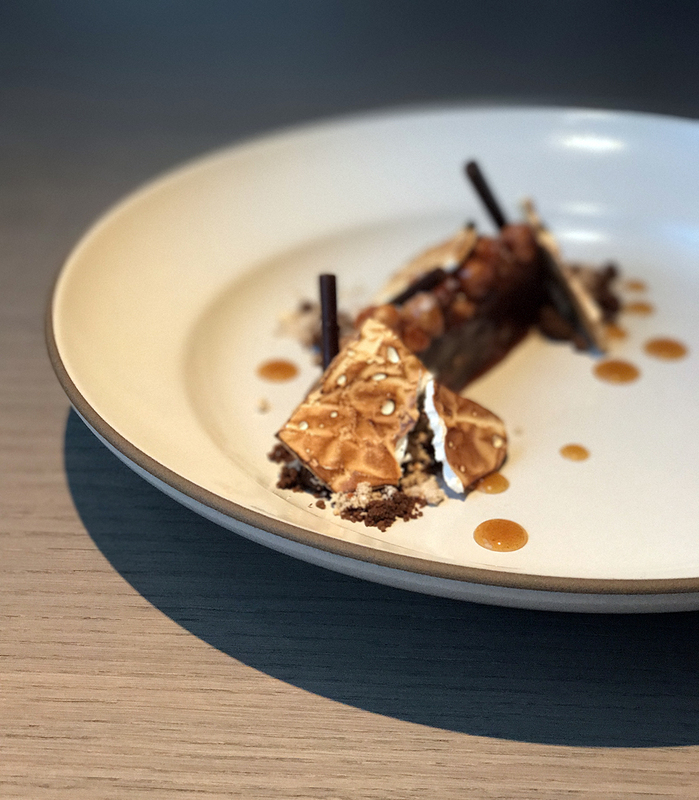 It’s topped with toasted hazelnuts and surrounded by toasted marshmallow, root beer foam, and pretzel shavings. This dessert is a must try for anyone who is dining at Acacia House. My creamsicle looked like a piece of mid-century modern art, orange and white checkers randomly assembled into a popsicle. It was fruity, fresh and cold. An excellent finish to this hot day and a beautiful meal. 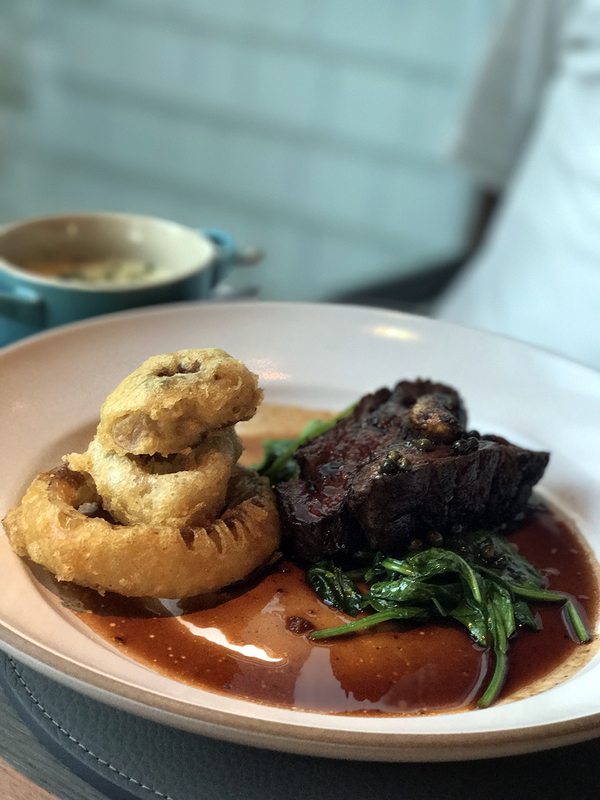 Excellent service, fun cocktails, well thought out dishes and a vibrant ambiance describes our visit to Acacia House at Las Alcobas. The Wine Ho gives it a thumbs up.